My friend and coworker Ryan had a birthday recently and asked if I had ever heard of Guinness cake with Bailey’s frosting. Car bomb cupcakes – of course! Not only had I heard of them, I’d been dying for an opportunity to try them. For those unfamiliar, an Irish car bomb is a drink consisting of a shot of Bailey’s and whiskey and a glass of Guinness. Sounds innocent enough, until you find out that the shot is dropped into the Guinness and the whole thing must be chugged before a foamy mess is all over the place. I have never tried this concoction, though I have seen Ben and his friends do this more times than I care to mention. Though I can’t vouch for the drink, I can definitely vouch for these cupcakes. Wow, these are fantastic cupcakes. 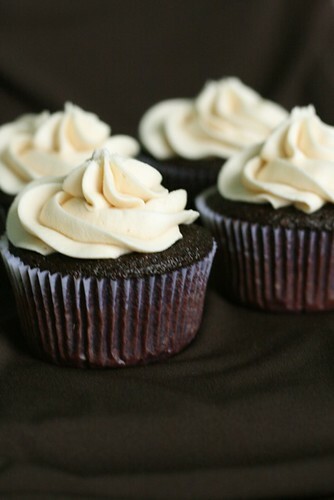 They consist of a Guinness chocolate cake base, are filled with a Bailey’s-spiked ganache, and topped with Bailey’s buttercream frosting. It sounds like a winning combination and it really, really is. These were hugely popular with the coworkers and received many thumbs up all throughout the day. They are fun to make, pretty, and they smell phenomenal. The beer flavor isn’t very prominent, but rather adds a nice depth to the chocolate cake. The Bailey’s ganache filling – I almost skipped it, but thank goodness I didn’t. It really put these over the top to amazingness. The Bailey’s buttercream was delicious as well and the flavor of the Bailey’s really came through. I did have to add quite a bit more Bailey’s than the original recipe indicates (darn!) but it turned out fine in the end. These are sure to be a hit wherever you serve them! To make the cupcakes, preheat the oven to 350° F. Line two cupcake pans with paper liners. Combine the stout and butter in a medium saucepan over medium heat. Add the cocoa powder and whisk until smooth. Remove from the heat and allow to cool slightly. In a large mixing bowl, combine the flour, sugar, baking soda and salt. In the bowl of an electric mixer fitted with the paddle attachment, beat together the eggs and sour cream to blend. Add the stout-butter mixture and beat just to combine. Mix in the dry ingredients on low speed just until incorporated. Divide the batter evenly between the cupcake liners, filling them about 2/3 to ¾ full. Bake until a toothpick inserted in the center comes out clean, about 17 minutes. Allow to cool in the pan for 5-10 minutes, then transfer to a wire rack to cool completely. To make the ganache filling, place the chocolate in a heatproof bowl. Heat the cream in a small saucepan until simmering, then pour it over the chocolate. Let sit for one minute and then whisk until smooth. If the chocolate is not completely melted, place the bowl over a double boiler or give it a very short burst in the microwave (15-20 seconds). Add the butter and Bailey’s and stir until combined. Set aside to let the ganache cool until it is thick enough to be piped. (You can use the refrigerator to speed the cooling process, but be sure to stir every 10 minutes or so to ensure even cooling.) Meanwhile, cut out a portion from the center of the cupcake using the cone method (a small paring knife works best for this). Once the ganache has reached the correct consistency, transfer it to a piping bag fitted with a wide tip and pipe it into the cupcakes. To make the frosting, place the butter in the bowl of a stand mixer fitted with the paddle attachment. Beat on medium-high speed until light and fluffy, about 2-3 minutes. Gradually add the powdered sugar until it is all incorporated. Mix in the Bailey’s until smooth. Add more if necessary until the frosting has reached a good consistency for piping or spreading. Frost the cupcakes as desired. OH!!! I will be making these!! I LOVE GUINESS!!!! And these cupcakes look amazing!!!!! Thanks for the great recipe!!! Bailey’s GANACHE!!! Oh my! They look just perfect, too! My cupcakes are never that pretty! you forgot the best part of a car bomb, half the shot is whiskey and half is bailey’s! Yum, those look delicious. Your picture is absolutely beautiful! These look great! Although not a fan of the shot I could definitely see myself being a fan of these cupcakes. I can’t wait to make these cupcakes, they sound awesome! These look great! I have never done an Irish car bomb but would love to try the cupcakes. I dont’ bake so I emailed your post to my sister, dad, and friend and told them that someone needs to make them so I can try them!! Oh! I just LOVE recipes with unique ingredients! I’m making these too! These look fantastic!!! I can’t wait to try out this recipe, Thank You! Yeah, as I mentioned in the post, I’m no expert on the drink as I’ve never had one – only watched in semi-disgust as others drank them. There is a bakery in my town that makes these and they are my favorite! I love Irish Car Bombs and can’t wait to make these, maybe this weekend! Too funny- I signed on to the get the Guinness cake recipe you posted awhile ago for my husband’s birthday… and this version is even more perfect! Can’t wait to try- thanks! It’s amazing how well Guinness goes with chocolate. I can’t drink it but it is good to cook with. I make a Guinness Chocolate Mousse for St. Patty’s day that is fabulous. Thanks for the recipe. They look fantastic! Might make this for DH’s birthday. I have one question though, in the ganache part of the recipe the last sentence is “Add the butter and whiskey and stir until combined” yet I can’t see any mention of whiskey in the ingredients list. So which is it – do I add Bailey’s or whiskey to the ganache? Sorry, I guess that was a bit confusing. I used that terminology directly from Smitten Kitchen and she seemed to use the terms “Bailey’s” and “whiskey” interchangeably. I have edited it to be more clear. Oh My.. These look fantastic and I have a free afternoon tomorrow, so I am heading to the store right after work! You mentioned you added quite a bit more Bailey’s for the frosting… exactly how much ? I am so LOLing because http://www.thesuperficial.com‘s facebook page posted a link to your cupcakes! I just got done looking at them in my reader! After I read your post today I told my husband about these cupcakes and he insisted that I make them for dessert tonight. They were amazing! We brought them to my parents house and my mom is not letting me take any home! FYI, I only made a half batch and the recipe was pretty easy to halve. Thanks for another winner Annie! OMG, thanks for tipping me off to that! I kept seeing all these hits from FB but knew they weren’t from my own profile. So random and awesome! If I had known exactly how much, I would have noted that. However, I just kept adding it and adding it in little bits until it had the right consistency. That’s the best I can do. It’s funny you have this on here as I was just talking to someone about these cupcakes tonight! My brother and his fiance have decided on these instead of wedding cake for their wedding. Can’t wait to try them! LOL….I’m one of the hits from thesuperficial.com . I read that site religiously so when your cupcakes came up…I had to share with all my FB friends. I am now a devoted reader of Annie-Eats!! Wow these sound fabulous! I need a cake for my dads birthday soon and might have to use this – looks divine! I made these, and they were delicious! I was surprised at how easy the ganache was to make, not having made it before; however, it got pretty firm and when the cupcakes were cut or bitten into, the ganache tended to want to fall out. Is there a way to make a softer ganache that will stick to the cake better and not firm up quite as hard? Hmm, that is strange. I’ve made these many times and I’ve never had that issue. Were the cupcakes chilled when you served them? If so, I would think letting them come to room temp might help. If you don’t think that was the problem, you could always whisk in an extra tablespoon of butter. Hope that helps! I have to ask, in total naivete… is the alcohol still potent when this is all made? I want to make them and bring them to a church social, and don’t want anyone going home drunk… especially any kids who might have one!?! It’s really up to you. When you think about the amount of alcohol divided amongst all the cupcakes, it’s very little. However, I personally would not serve them to children. Whatever you decide, enjoy! Thanks Annie, I _knew_ you would have a cupcake recipe that would be perfect for St. Patrick’s day :). (though I think my mom will probably lobby for today’s post, the tiramisu cupcakes). Yes, I adapted it to suit my tastes, hence the “adapted from” in the source. Do you think these will be fine if I have to store then in the fridge before serving? I wasn’t sure if it would harden the ganache…it might still be tasty that way though? Anyway, I just wanted to ask your advice! I made these yesterday, and I cannot rave about them enough. They are moist, chocolate-y, and rich, and the flavours are surprisingly complex! I doubled the icing recipe (I like a lot of icing on my cupcakes) and used 4 TBS of Bailey’s & 3 TBS of heavy whipping cream. (I love Bailey’s, but it can get strong quickly.) My husband doesn’t like Bailey’s and he positively loathes buttercream icing, yet he loves both the ganache and the icing. Wowza! I’ve made these before, but with whiskey ganache filling because real irish car bombs are baliey’s, whiskey, and guinness. It’s really good with that cause the ganache is a little bitter while the rest of the cupcake is quite sweet.